I don’t know about you, but I LOVE autumn. I totally get that, for most, Summer is the most popuar season- but for me, Autumn is the best. The golden leaves falling on the ground, its still light (ish) in the evenings, its still warm(ish) and you get to wear your beautiful boots which I have plenty of pairs of! 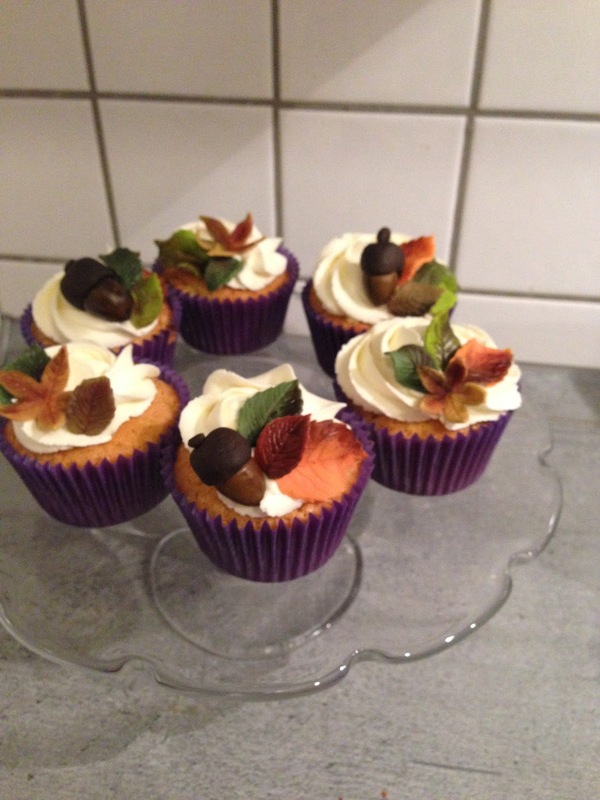 Now its October, I decided to welcome Autumn in, in style with these leafy cupcakes. 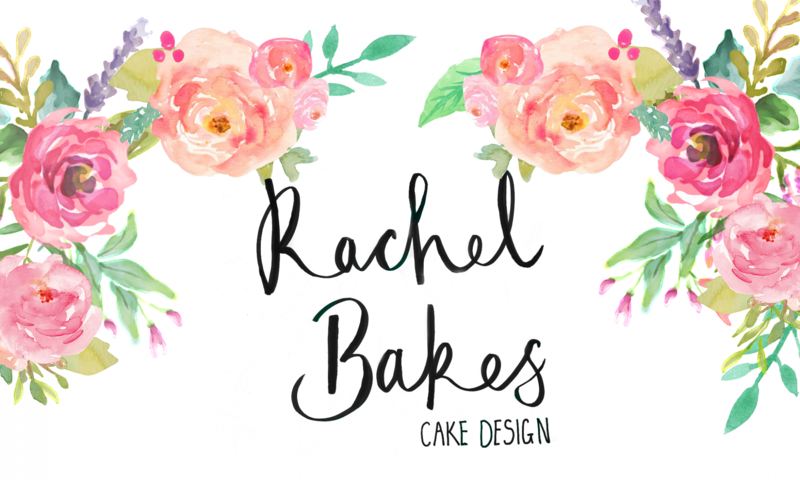 I started off by making my ‘go to’ cupcakes. The recipe for these is super simple- weigh your eggs (using an electric scale is best for this) then add the same weight of- sugar, butter/marg, and self-raising plus a splash of vanilla extract. Having discovered that Germany doesn’t sell self raising, you can use plain or ‘cake’ flour with 1 1/2 tsp of baking powder. For example; today my 3 eggs weighed 178g. so I used 178g of sugar, 178g of flour, and 178g of butter and a splash of vanilla extract. 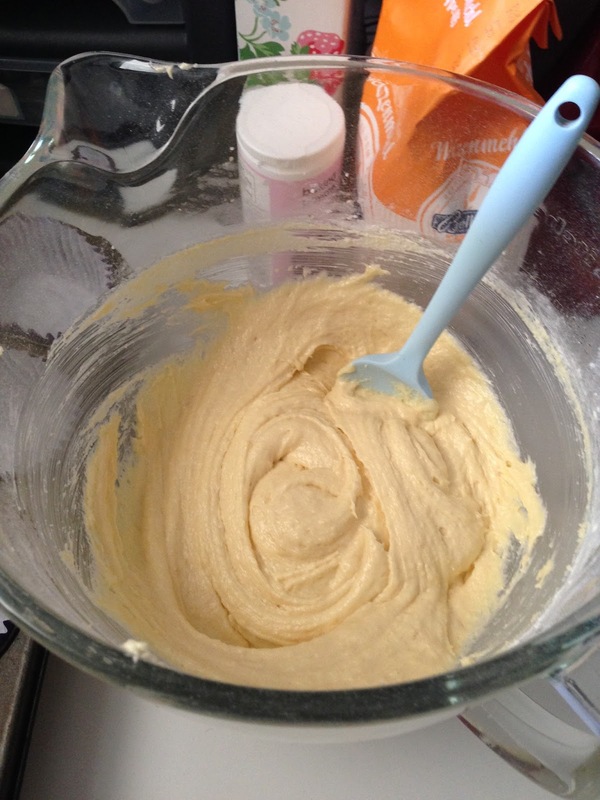 Again, with it being super simple- you just whack it all in the mixer together and mix until it is nice and fluffy- Viola! 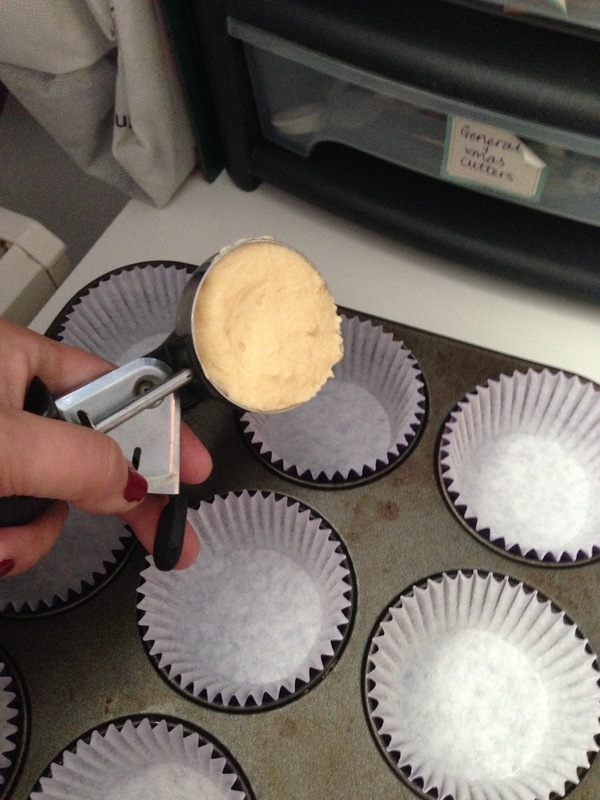 When making cupcakes you want to get just the right amount of mixture in each cup, otherwise you end up with a mixture of sizes- some over-filled, some under-filled. The best way to combat this I have found is using an ice-cream scoop! 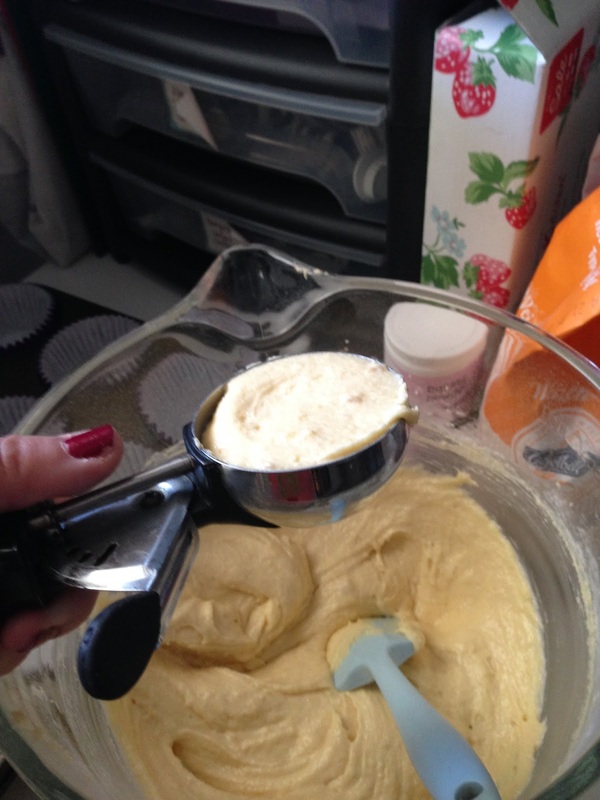 Each dollop is the perfect amount of mixture for your lovely cakes- from the 3 eggs I ended up with 13 good sized cakes. 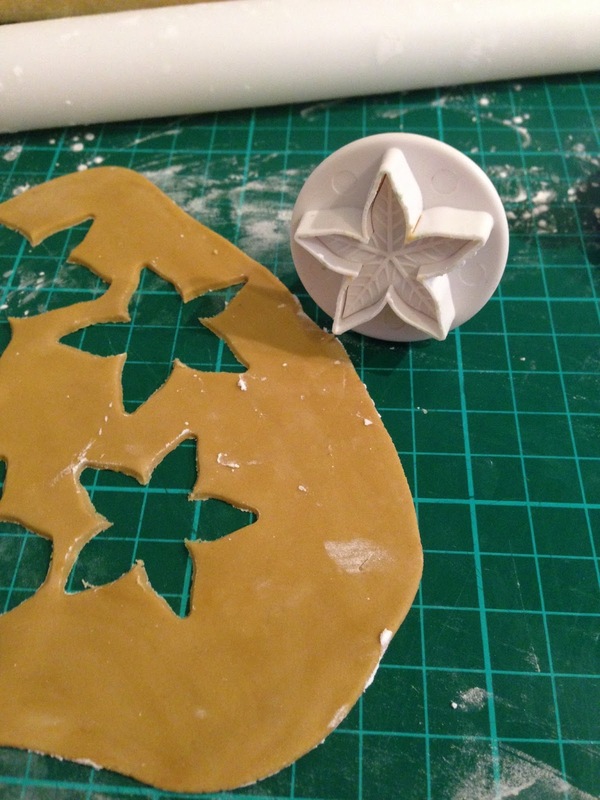 Now whilst they are in the oven you can start to make your decorations. 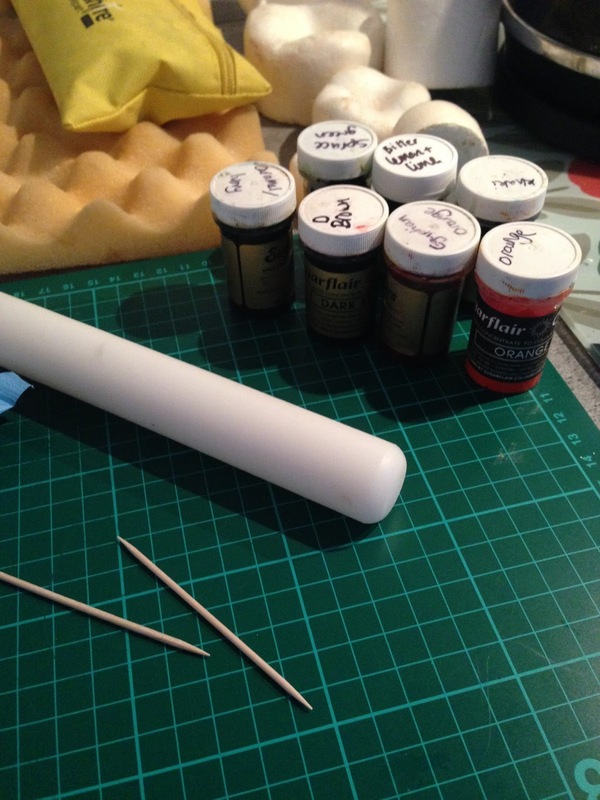 For these you need a couple of basic tools to get you on your way. Firstly you need to mix up your colours, choose the ones you want and using the cocktail sticks add the colour gradually- its better to do this slowly as the only way to undo once it is too dark is to add more icing! 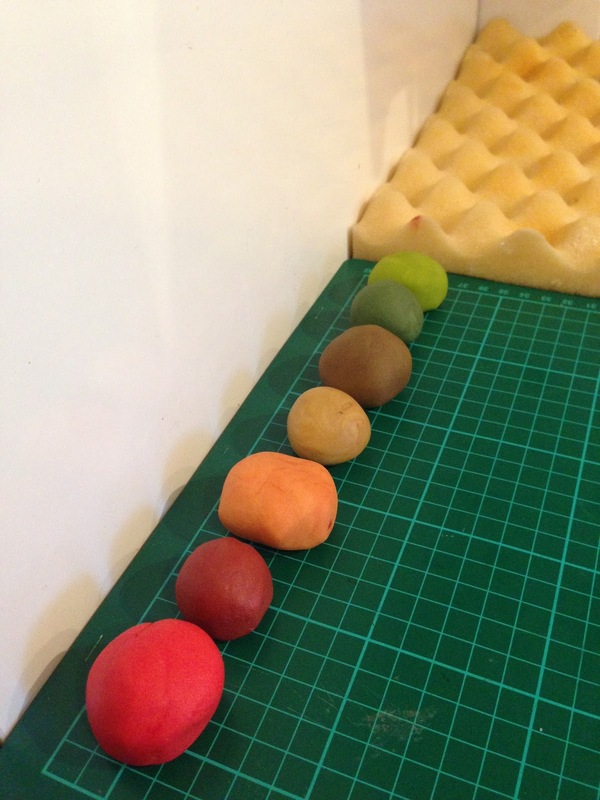 I always like to make all my colours first then it gives the icing time to rest making it easier and more stable to roll out. This is exactly the same when colouring icing to put onto a cake. 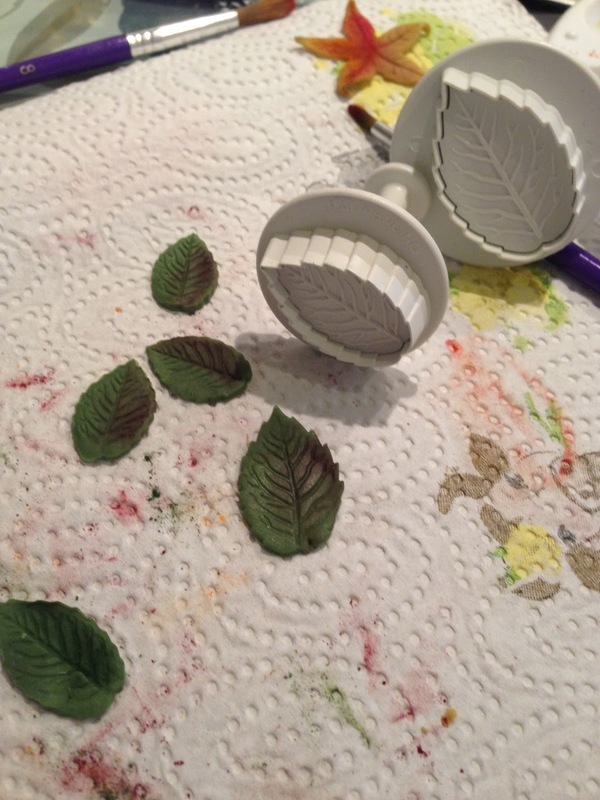 Next, choose a colour and a cutter and cut out a range of different styles of leaf- this was a small caylix, I know these are not real leaves but they looked great on the finished cakes! Be sure to press down on the plunger to get the lovely lead detail on your cut out! 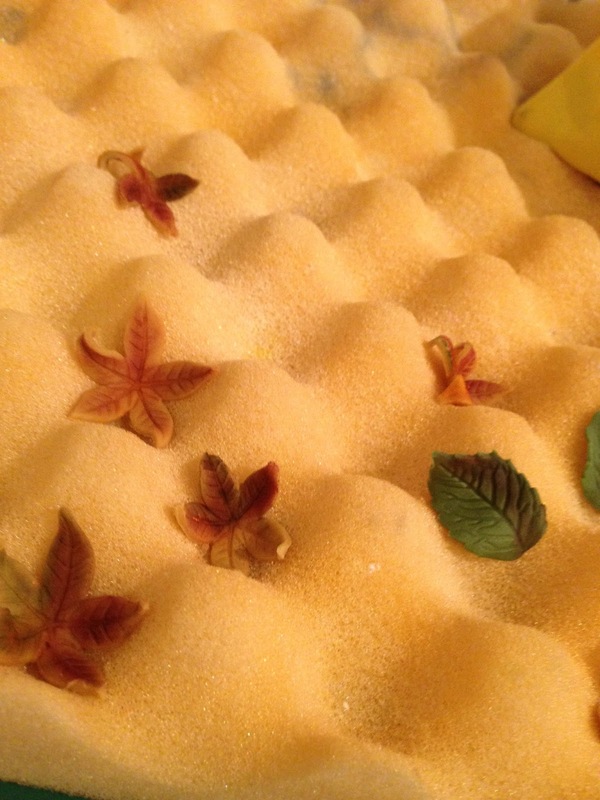 Now its time to dust your leaves to give them a little bit of life and stop them looking so flat. 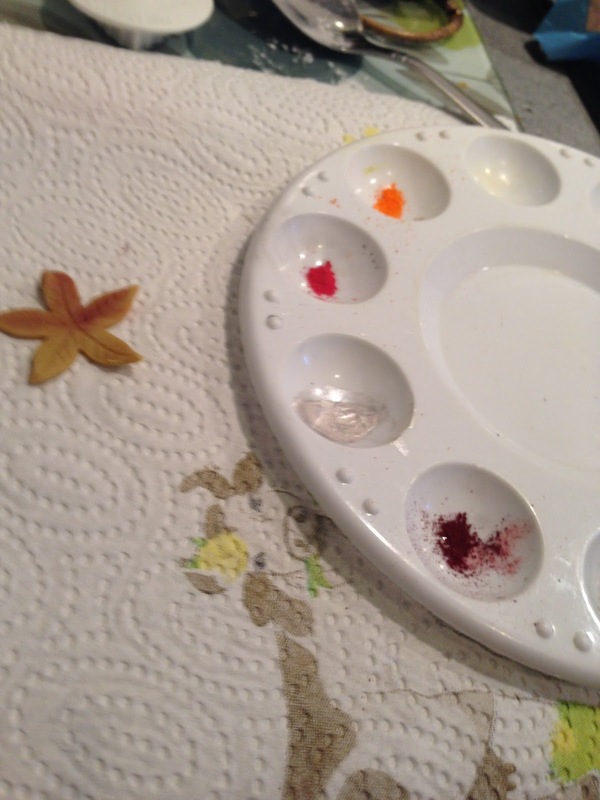 Carefully add a little bit of colour into either a colour palette or small dish. 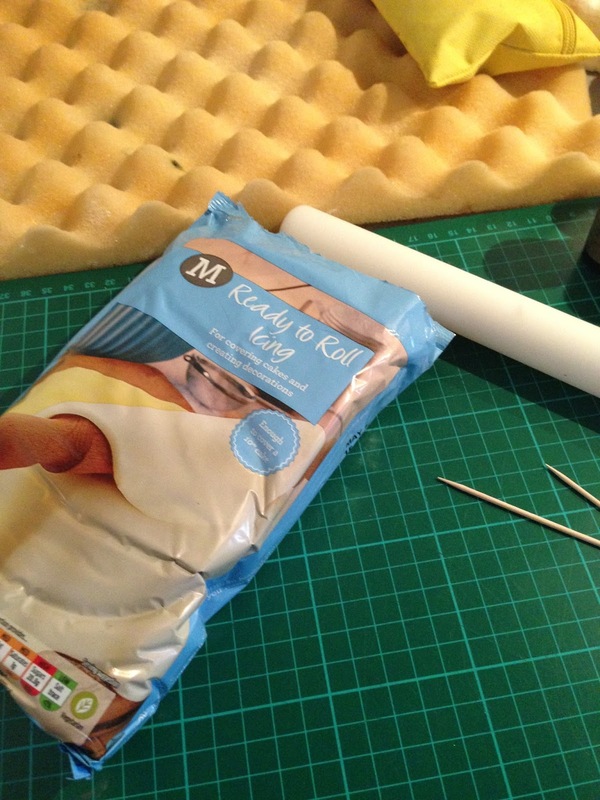 Covers your brush in the dust and tap on the side to get rid of any excess- you will want to do this on kitchen roll to save your counter tops! 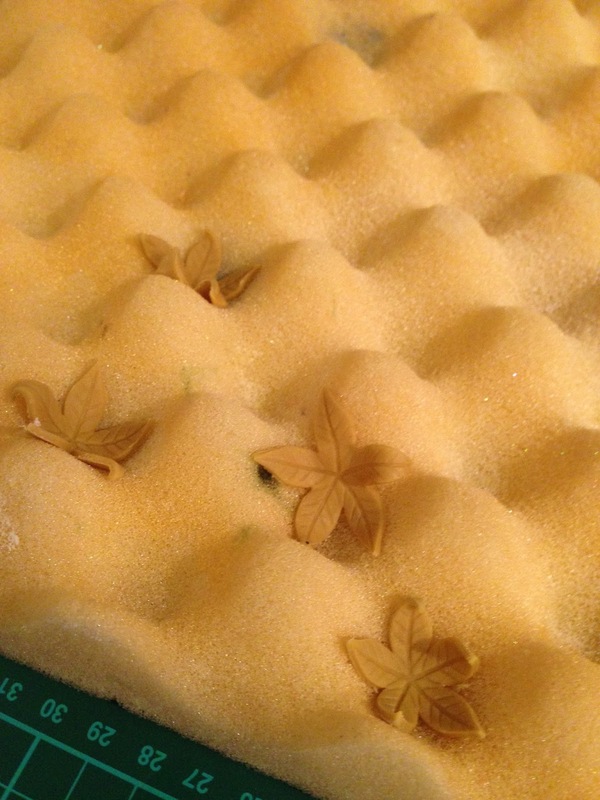 Start at the edges and move inwards using very little pressure as you do not want to remove the embossing on the leaves. 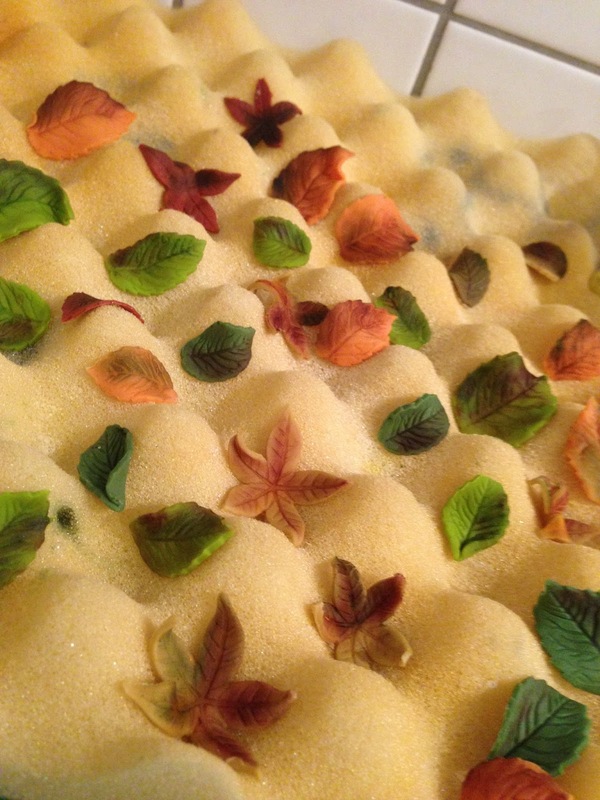 Once you have dusted up your leaves place them on a foam mat, these are great as they can give your flowers and leaves shape as they dry. 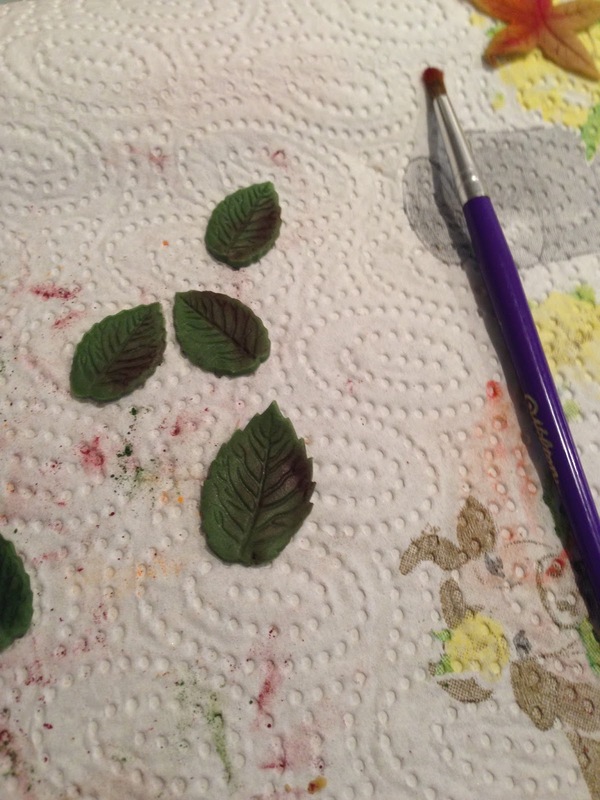 I gave all my leaves a slight curl in various directions so that were all slightly different. As I got a little carried away I forgot to take pictures of adding glaze and making the acorns… I will be sure to make these again and give a tutorial on them! 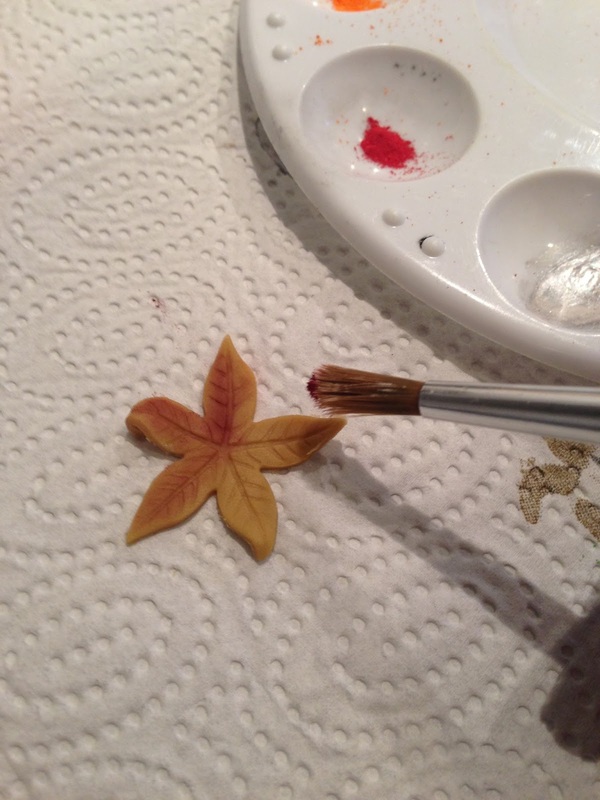 When adding the glaze, I did not cover the entire leaf, I only went over parts where I had added petal dust just to give a little more life to them. 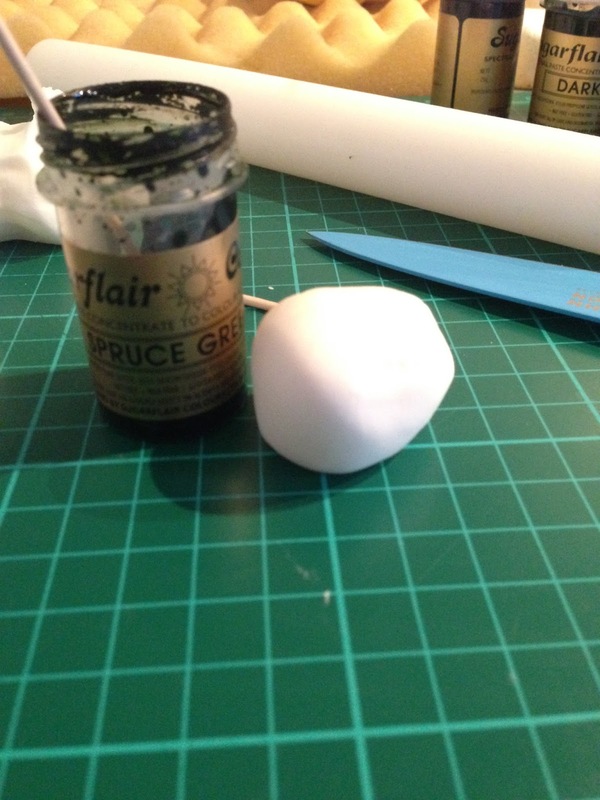 It is also at this point I like to add a little extra something to my cupcakes and add a tasty filling- cut a hole in the top, add a dollop of your favourite jam – I chose a tasty sour cherry jam – and pipe a swirl using a 1M nozzle. 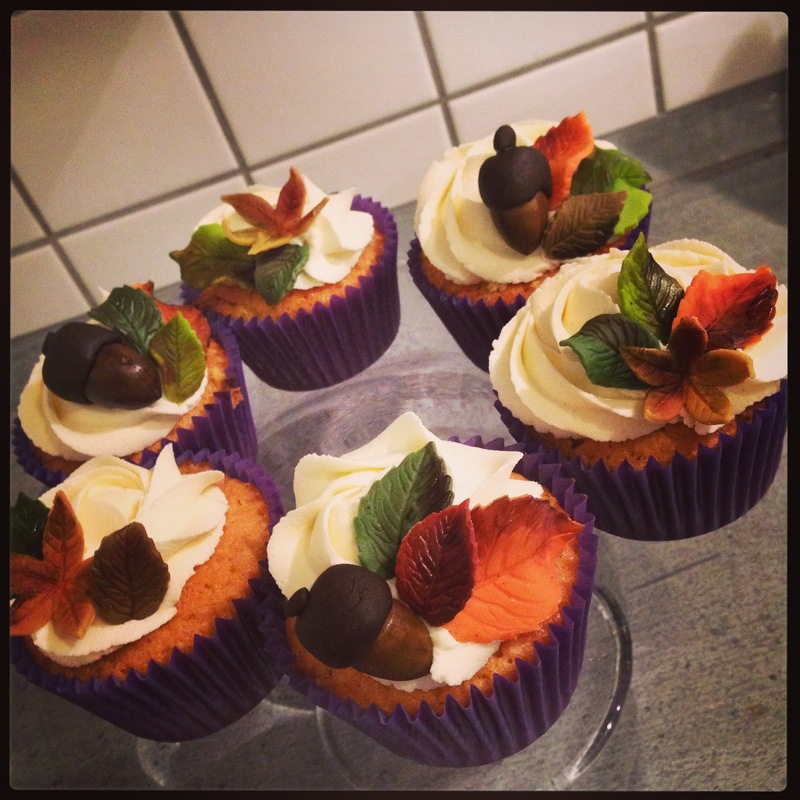 Add your leaves and ta-da, you have yourself some lovely Autumn cupcakes! Any questions be sure to leave a comment, hopefully next time I will remember to take more pictures! Previous PostPrevious Brownies- gooey, yummy, deliciousness! Next PostNext Ba-nana-nana- banana loaf!